They’ve been good. They’ve been a little lucky. They’ve played as a team and have shrugged off misfortunes. Mostly, they’ve refused to be intimidated and have battled three foes for the full 48 minutes of three grid games. And now, for the first time in school history, a Wood River High School varsity football team has started the season 3-0 with all three of the wins coming away from home. Wood River (3-0, 2-0 Great Basin Conference) will try to make it four in a row when the Gooding Senators (2-0, outscoring opponents 133-6) arrive in Hailey for the 2014 Homecoming game Friday, Sept. 19 at 7 p.m. at Phil Homer Field. The buzz for football in Hailey is electric. Wood River has become a good football team. They will be playing a very good football program under the leadership of sixth-year coach Cameron Andersen. Gooding (20-4 over 3 years including two State 3A third-place finishes in 2012 and 2013) has been a tough opponent for the Wolverines, having won 55-6 at Gooding last year and 13-0 when the teams last played in Hailey in 2012. Last year Gooding piled up 258 rushing yards and out-gained Wood River 445-210 overall. The Senators scored on big plays measuring 55, 44, 19, 64, 34, 20 and 23 yards. Wood River coach Kevin Stilling said, “Last year’s Gooding game was a debacle and an embarrassment. I believe Gooding is the best-coached, best-schemed defense we’ll see all year. They are extremely physical, and they have great team pursuit. Wood River posted back-to-back wins by scores of 20-6 in Gooding in 2011 and 14-12 at Homecoming in Hailey four years ago, in 2010. The Senators lead the all-time series between the two schools 27-10 dating to 1960. This season, Wood River’s three road wins have been 17-14 at Jerome Aug. 29, 41-6 at filer Sept. 5 and 24-21 (OT) at Twin Falls last Friday. Read more about the nailbiting Twin Falls victory on page B-2. Stilling has achieved much with the Wood River program over six years and is aiming for the best Wolverine league finish in 10 seasons of Great Basin Conference competition. His 2011 Wolverine team was 6-4 for third place in the league—scoring the most points (281) in 45 seasons of Wood River football and most wins in 36 years. 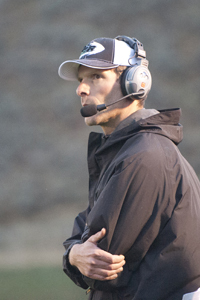 His 2010 team gave Wood River its first winning season in 10 years. The current team has posted a Wolverine win at Jerome for the first time, and has beaten Twin Falls for the first time. Seven times in 55 seasons, a Wood River football team has started a season 3-0, but never winning all three games on the road. Most of those 3-0 starts came in the 1960s—five times. Others were in 1975 and 1979. The last time Wood River started a season 3-0 was 35 years ago in 1979 for coach John Hopkins—beating Filer, Wendell and Kuna. But that team never won another game, finishing its season 3-5-1. The 8-2 Wolverine team of 1975 started 5-0 with wins over American Falls, Salmon, Bishop Kelly, Jerome and Filer before falling to Blackfoot on Homecoming 31-7. Prior to that, coach Bill Bowman’s 1968 Wolverine team started 5-0 including a 38-0 Homecoming win over Glenns Ferry that extended the three-year Wood River winning streak to 24 games. Members of the 1968 squad that finished 8-1—making Wood River’s three-year record 26-1 with 15 shutouts—included Dan Bell, Ron Fife, Ken Byington, Ken Patterson, Dan Cutler, Dan Deckard, Dennis Saijo, Jim Robertson, Pat Simpson, Bob Ratto, Chris Hoag, John Shirts, Buddy Isom, Tim Collier, Scott Bowlden, Mike Kimball, Dennis Patterson, Lee Bowcutt, Jesse Hurst, Bob Nicholson, Al Miller, Richie Sims, Kim Schmidt, Carson Duffy, Rick Knight, Ed Guisasola and LeRoy Bartlome. Among their coaches were Bob Shay, Chuck Turner and Phil Homer. They are three Blaine County educators who have local fields named after them and, in Shay’s case, have memorial running meets and school awards named for him. Homecoming Week is in full swing at Wood River High School. Here’s the remainder of the Homecoming Week “Spirit Day” and activity schedule. Senior parents are organizing the barbecue as the major fundraiser for the 2015 Senior Bash that is part of graduation. Alumni and all community members are welcome. Friday’s tailgate barbecue is served from 5-7 p.m. in the area adjacent to Hailey’s Phil Homer Stadium. The Homecoming dance is after the game in the commons area. Senior girls (Queen): Lucy Brannon, Rory Cole, Sammy Sutton, Tatum Morell and Brigette Thomas. Senior boys (King): Parker Bingham, Chago Gomez, Sage Kelly, Zach Swanson and Hayden Thayer. Junior girls: Grace Kotara, Caitie Sfingi, Maggie Sfingi and Daisy Vargas. Junior boys: Brady Delgadillo, Gunner Gibson, Danny Graves and Jordan Bjorkman. Sophomore girls: Emma Coulthard, Tess Hollister, Julia Larson and McKenna Norris. Sophomore boys: Jubal Toothman, Travis Swanson, Kenny Pratt and Owen Gifford. Freshman girls: Grace Evans, Aby Benson, Stella Barsotti and Ellie Gorham. Freshman boys: Ike Buxton, Jett Erickson, Wyatt Parish and Canyon Macdonald.